Upper Darby, PA – At their annual banquet last night, the Philadelphia Greek Basketball League ended a chapter in its history. Co-commissioners Bill Zonios and John Vasiliou bid farewell and turned the reigns over to the league’s new leadership. Yioti Kasapis, Louie Karapanagiotidis, and Stephen Karas were announced as the official new commissioners of the league. The evening kicked off with three awards being presented. Defensive player of the year, Spiro Karalis, league MVP Pete Kada, and scoring leader Pete Kathopoulis were acknowledged for their efforts on the court. That was followed by the new inductees to the PGBL Hall of Fame. Harry Karapalides, Vasilis Nasis, and Vasilis Rousseas became members of the prestigious class of 2017. Evan Ostrosky of the Philadelphia 76ers presented John Vasiliou and Bill Zonios with rare bottles of wines from Chadds Ford Vineyards. 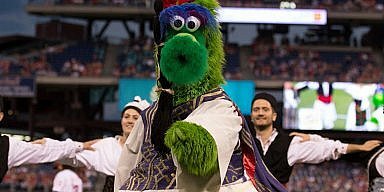 Ostrosky thanked them for their dedication to their community and their effort in organizing Greek Heritage Night at the Sixers. The evening was co-sponsored by the Greek American Heritage Society of Philadelphia. Nick Yiantsos, President of the GAHSP, spoke on behalf of the organization. He also announced and shared an open invitation to the second annual “Photographic Tour” that will be hosted on May 7th, 2017. Bill and John then took turns summarizing their ten years in and around the league. They both talked about each others devotion to the league and friendship that has grown. 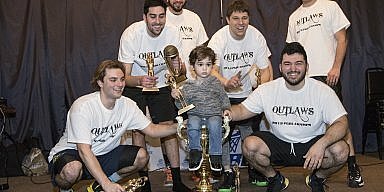 A decade ago, the two GOYA friends (Bill Zonios and John Vasiliou) made their dream a reality, when they started the men’s community basketball league at St. Demetrios Greek Orthodox Church. The PGBL was launched in 2007-2008 and immediately reignited the historic Greek neighborhood and church by uniting culture, sports and a kafenio like atmosphere. It became a place to mingle with Greeks in the community, watch basketball, enjoy fresh Greek food and even play backgammon. Thursday Nights became known as PGLB Nights, and St. Demetrios had become the place to be and feel part of a Greek community. The documentary film “We Love Thursday Nights,” made about the PGBL was featured at the end of the evening for everyone to see. Guests were treated to the historical film that captured the spirit of the PGBL, and it’s decade long history. It capped off the final Thursday night of the year for the now retired commissioners, Bill Zonios and John Vasiliou.